Jeanette “Jae” Barrick received her bachelor’s degree from Florida State University. She was the first member of her family to obtain a college degree. After a career in the financial industry, Jae decided to enroll at Boyd School of Law. She is currently with the firm Gallian Welker & Beckstrom. 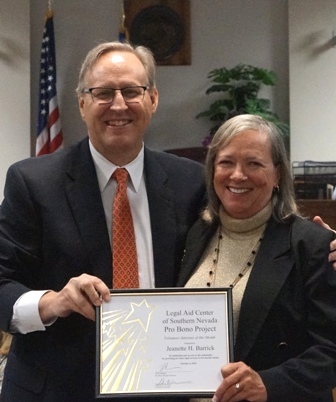 For her commitment to pro bono, we honor Jeanette “Jae” Barrick as our August Volunteer of the Month.